This post describes a prototype implementation of a simple PAAS built on the Hadoop YARN framework and the key findings from the experiment. While there are some advantages to using Hadoop YARN, there is at least one unsolved issue that would be difficult to overcome at this point. Note that this was done as part of the research works at SAP Labs! YARN is the next generation Hadoop MapReduce architecture. It is designed to be more flexible architecturally, improve scalability, and achieve a higher resource utilization rate, among other things. Although YARN remains similar to the old Hadoop MapReduce architecture (let’s call it Hadoop MR1), the two are different enough that most components have been rewritten and the same terminology can no longer be used for both. In short, the Hadoop YARN architecture (or called MR2) splits the two major functions of the JobTracker of MR1 into two separate components – central Resource Manager and Application Master per application. This new architecture not only supports the old MapReduce programming model, but also opens up the possibility of new data processing models. Why was HADOOP YARN considered as PAAS? A large scale PAAS offering needs to solve many of the same problems that Hadoop already addresses. 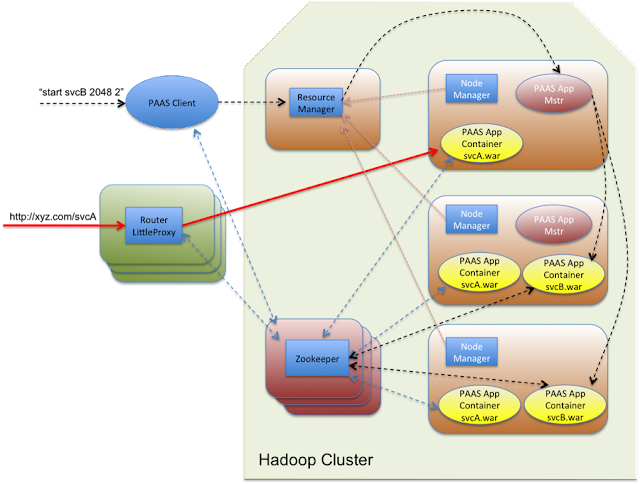 Hadoop is a framework for running applications on large clusters of commodity hardware. This commodity characteristic drives down costs and avoids vendor lock in. Many companies have already deployed a Hadoop cluster for big data processing. So it can be easier in terms of development and operational adaptation to use it as PAAS than to adopt another PAAS solution. This can also bring in efficiency of resource utilization as one Hadoop cluster can be used for both big data processing and PAAS. Hadoop YARN’s three-layer architecture (client, Hadoop YARN core, application instances) looks like a good fit for PAAS. Hadoop YARN’s monitoring and resource management capabilities (i.e. 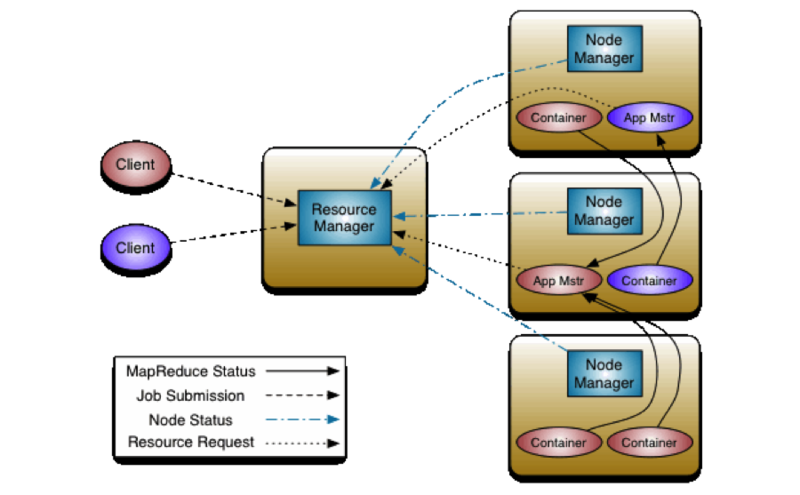 Resource Manager and Node Managers) seem promising for PAAS. Hadoop is a JAVA framework, which is good for many enterprise companies in the sense that they already have enough Java developers. With HBase, Hadoop can be used as a NoSQL database, which can be exposed as a PAAS service. 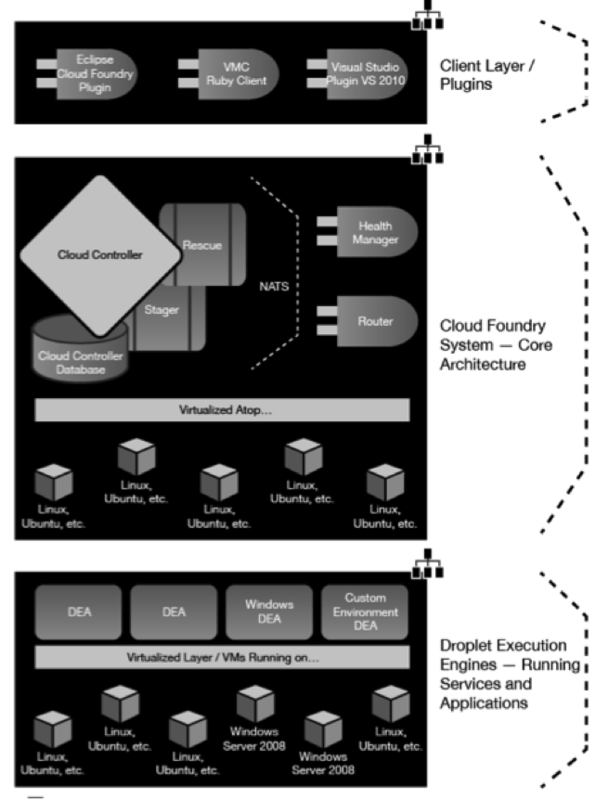 Before we jump to the prototype design and implementation, let’s briefly take a look at a well-known PAAS, VMware’s Cloud Foundry. The following gap analysis highlights missing components in Hadoop YARN that would need to be added in order to create a YARN-based PaaS offering. Note that we consider the CloudFoundry.org open source offering here, not the CloudFoundry.com commercial offering. Cloud Foundry has three distinctive architectural layers: the client layer, the core layer, and the services and application layer. Interestingly, this three-layer architecture is very similar to the Hadoop YARN architecture. We can mimic the same push behavior in the YARN client mentioned in the previous item, assuming that web containers (e.g. Jetty or Tomcat) are launched and run as application containers in nodes. There is nothing like Router in Hadoop YARN. We need a high performance http proxy similar to Nginx. In Hadoop YARN, the Application Master in coordination with the Resource Manager can perform a similar role. We need some synchronization service among Hadoop components and non-Hadoop components (e.g. Router). HBase uses ZooKeeper to provide similar functionality. The Resource Manager and Node Managers do a similar role. A container is YARN’s shell environment to run an application instance. One of the biggest gaps between Cloud Foundry and Hadoop YARN. No service support in Hadoop YARN. Has limited support. Only Container-level multi-tenancy is supported. As we saw in the previous section, Hadoop YARN is missing some PAAS components and capabilities when compared to Cloud Foundry. But it still has many desirable features for a PAAS. In order to better understand the characteristics of such a system, we attempted to implement a basic PAAS prototype by leveraging built-in functionality as much as possible and filling gaps with additional services as needed. A generic command line YARN client to provision applications, start application instances, stop a number of running application instances. Beyond that, since we needed the capability of router to serve as an entry point for incoming application requests and route requests to the corresponding application instances, a java implementation of http proxy called LittleProxy was slightly modified and used. Furthermore, to synchronize the states of application instances among PAAS components, ZooKeeper was used. PaasClient is a dedicated YARN client that works like a command shell to process PAAS commands. It’s written in Java. Users (i.e. operators) can issue commands in the client to provision application files (i.e. war files), start or stop application instances, get a list of instance information, and get YARN application status. PaasAppMaster is a YARN application master that manages a lifecycle of PAAS application instances. For each ‘start’ command, one instance of PaasAppMaster gets created, which then tries to create the requested number of PaasAppContainer instances. Its life lasts until all the PaasAppContainer instances stop or fail. PaasAppContainer is instantiated by PaasAppMaster as a YARN container according to the requested resource limit (e.g. memory limit of 2G). It is a wrapper around the embedded Jetty web container that loads the war file for the requested service (e.g. ‘start HelloWorld 2048 2’), and interacts with Zookeeper to register and unregister itself so that the Router can update its routing table. The Router’s main function is to route and distribute application requests to the running application instances. We used LittleProxy, a java implementation of HTTP proxy using Netty asynchronous networking framework, and modified it so that it maintains a routing table in ZooKeeper and routes requests based on the routing table. Whenever a PaasAppContainer instance registers or unregisters to ZooKeeper, this event is notified to Router, which in turn updates the routing table accordingly. Ø To keep track of running application instances. PaasAppContainer instance registers or unregisters itself to ZooKeeper when it starts or stops. This information is used by Router. Ø To stop application instances in coordination with PaasAppContainer instances as YARN does not provide a functionality to stop individual containers. · An Admin user issues a push command in PaasClient like “push /Users/PAAS/svcA.war”, where svcA.war file is a web application file of the service named ‘svcA’. Then the PaasClient uploads the file to the Hadoop server by using ‘scp’ and ‘ssh’. There is a dedicated directory in the Hadoop file system to save War files (e.g. /PAAS/), while non-application libraries and jar files are stored in a different directory. 1. Admin user issues a start command in PaasClient like “start svcA 2048 3” which is to start 3 “svcA” application instances of 2G memory limit. 2. PaasClient connects and requests to Hadoop Resource Manager one container for PaasAppMaster. Once it gets one allocated, it issues a request to start PaasAppMaster in the container with some parameters such as what application to run and how many instances to start. 4. When PaasAppContainer instances get started, they load the corresponding WAR file from Hadoop file system and starts embedded Jetty web container. After the Jetty web container is successfully started, the PaasAppContainer instance registers itself to ZooKeeper with the service url of the Jetty web container. 5. This registration event will be notified to Router, and then Router updates its routing table. At this point, the application instance is ready to serve app users’ requests. Admin user issues a stop command in PaasClient like “stop svcA 2” which means to stop 2 instances of svcA application. PaasClient chooses randomly as many instances as the requested number among the running app instances and deletes the corresponding registration information from ZooKeeper. These deletion (i.e. un-registration) events will be notified to the corresponding PaasAppContainer instances, and then the instances stop themselves. Although we can do a more intelligent container stopping process such as waiting for all the existing sessions to complete their works for a reasonable duration before stopping the container, we chose the simplest approach of stopping right away for the prototype. This is certainly a limit of the prototype. We used Hadoop version 0.23.1. The Hadoop YARN cluster consisted of 5 VMs. One VM was dedicated as Resource Manager, while the others were application nodes. Router(modified LittleProxy) and ZooKeeper were run on a separate machine. Prototype development was fast. Within a week, one person could write a basic flow including starting application instances even though he had a very limited knowledge about YARN at the beginning. As expected, resource management (container allocation based on a resource requirement) is done well. Hadoop file system is certainly good enough as an application repository. The current version Hadoop YARN supports only memory-based container allocation. But we’re told that this is going to be improved in coming releases. There is a very limited set of monitoring APIs. For example, there is no easy way to monitor the health state of each Application container (e.g. memory consumption, and more). But again, we're told that Hadoop team is working on more monitoring capabilities now. Each ‘start’ command creates a new instance of PaasAppMaster , even though there might already be a running PaasAppMaster. This might happen, for example, when a user with a running application tries to add more PaasAppContainer instances to handle additional load. After we had implemeneted the prototype, we were told that this problem can be fixed by using YarnRPC protocol, but we didn’t try to fix it due to a development time constraint. We successfully implemented a PAAS prototype whose scope is limited to basic PAAS functionalities (i.e. provision applications, start/run/stop multiple application instances in a random fashion in a Hadoop cluster). For the most part, we were able to fill the gaps we identified in the beginning of the process and built a working PAAS relatively easily and quickly. Hadoop YARN’s memory based resource management worked very well for the PAAS prototype. We stopped the experiment because of a few critical limitations would take significant work to overcome to use Hadoop YARN as a PAAS, including Hadoop YARN’s programming model (i.e. map-reduce or DAG programming model) and limited monitoring capabilities. We have demonstrated that it’s already usable as PAAS for a limited scope by adding additional components and services. Over the long term, Hadoop YARN is a promising foundation for a PAAS, considering that the architecture is still evolving and the above-mentioned problems may yet be addressed. The prototype implementation is hosted at GitHub. Published at DZone with permission of Jaigak Song , DZone MVB. See the original article here.